Thousands of people gathered in the Basilica of Our Lady of Guadalupe July 31, 2002, for the canonization of Juan Diego, to whom the Blessed Mother appeared in the 16th century. Pope John Paul II celebrated the ceremony at which the poor Indian peasant became the Church’s first saint indigenous to the Americas.The Holy Father called the new saint “a simple, humble Indian” who accepted Christianity without giving up his identity as an Indian. “In praising the Indian Juan Diego, I want to express to all of you the closeness of the church and the pope, embracing you with love and encouraging you to overcome with hope the difficult times you are going through,” John Paul said. Among the thousands present for the event were members of Mexico’s 64 indigenous groups. First called Cuauhtlatohuac (“The eagle who speaks”), Juan Diego’s name is forever linked with Our Lady of Guadalupe because it was to him that she first appeared at Tepeyac hill on December 9, 1531. The most famous part of his story is told in connection with the Feast of Our Lady of Guadalupe (December 12). After the roses gathered in his tilma were transformed into the miraculous image of Our Lady of Guadalupe, however, little more is said about Juan Diego. In time he lived near the shrine constructed at Tepeyac, revered as a holy, unselfish and compassionate catechist who taught by word and especially by example. During his 1990 pastoral visit to Mexico, Pope John Paul II confirmed the long-standing liturgical cult in honor of Juan Diego, beatifying him. Twelve years later he was proclaimed a saint. Comment: God counted on Juan Diego to play a humble yet huge role in bringing the Good News to the peoples of Mexico. 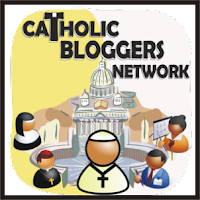 Overcoming his own fear and the doubts of Bishop Juan de Zumarraga, Juan Diego cooperated with God’s grace in showing his people that the Good News of Jesus is for everyone. Pope John Paul II used the occasion of this beatification to urge Mexican lay men and women to assume their responsibilities for passing on the Good News and witnessing to it. 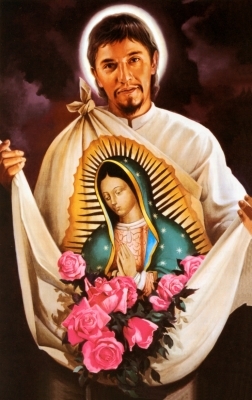 Quote: “Similar to ancient biblical personages who were collective representations of all the people, we could say that Juan Diego represents all the indigenous peoples who accepted the Gospel of Jesus, thanks to the maternal aid of Mary, who is always inseparable from the manifestation of her Son and the spread of the Church, as was her presence among the Apostles on the day of Pentecost” (Pope John Paul II, beatification homily).